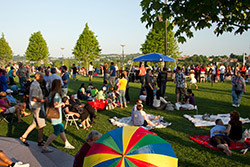 Imagine a day together at the new Smale Riverfront Park. Come along! Our day starts with an early morning walk along the Race Street Promenade with its amazing views of the historic Roebling Suspension Bridge. We’ll pass by the cobbled Wharf with its colorful excursion boats, and the river taxis busily preparing for the day’s passengers. We might purchase a fresh breakfast pastry and a cup of hot coffee from one of the many pushcart vendors we'll encounter along the esplanade. Children and adults will want to play in the unique P&G Vibrant Playscape with its creative play structures and fascinating “cause and effect” elements. Of course a ride on the Cincinnati carousel—with its flying pigs and other unique animal figures —is a must! We’re in luck, because a mid-morning concert is just about to start at the Schmidlapp Event Lawn. We’ll take the Grand Stairway to the Walnut Street Fountain along Berry Way where we’ll see the colorful water jets and waterfalls that drop into the pools at Mehring Way. 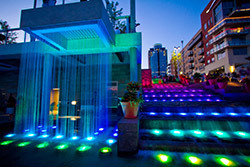 Then, we’ll walk across one of the fountain’s glass balconies and take in a sweeping view of the river. Then, a walk along the park’s labyrinth will offer some moments for quiet introspection. After the concert, we’ll probably want to take one of the meandering walkways in the tree grove (one of two l in the park) at the Roebling Lawn and enjoy a picnic lunch. We’ll watch the rolling river traffic, kids flying kites, families playing Frisbee, and cyclists pedaling through the bike trail. Then after lunch, we won’t want to miss walking through the changing seasonal garden displays and seeing the many art installations throughout the park—including a monument honoring the heroic efforts of Cincinnati’s Civil War era Black Brigade. Later, before we walk to Great American Ballpark for a night game, we’ll enjoy a delicious dinner at the distinctive Moerlein Lager House—where Cincinnati’s historic beer brewing tradition is celebrated everyday! Afterwards, we’ll walk out to the pathway along the Duke Energy Garden to sit for a moment on one of the oversized, trellis-shaded porch swings where the evening river traffic will be rolling by. We’ve had a terrific day—and we’re already looking forward to coming back to Smale Riverfront Park in a few weeks for a great regional festival! Now, aren’t you glad you came along? Sasaki Associates—which has created some of the most recognizable icons of modern landscape architecture—was selected as the design firm for Smale Riverfront Park in 2001. 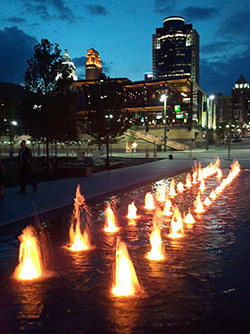 Sasaki’s landscape architecture practice is integrated with civil engineering and urban design to create new designs on diverse and challenging sites, including urban waterfronts—like Smale Riverfront Park. Sasaki Associates’ work was inspired by the input of citizen stake-holders at a series of public meetings and focus groups that began in 1998. The design plans are consistent with the Park Master Plan—created by Hargreaves Associates and approved in 1999 by the City, County, Planning Commission, Park Board and the Urban Design Review Board. Take a virtual tour of the new Smale Riverfront Park with an animated flyover!